Gilbert O’Sullivan is a singer and songwriter who is a native of Waterford City, Ireland. He is best known for his hit songs such as: ‘Nothing Rhymed’, ‘Alone Again’, ‘Clair’ and ‘Get Down’ recorded during the 1970’s and 1980’s. His songs remain well-loved around the world and the public continue to hold him in high regard. Gilbert O’Sullivan was born Raymond Edward O’Sullivan in Waterford on December 1st 1946. At the age of seven he moved to Swindon in England with his family. Following graduation from school he attended Swindon College of Art. Interested in music from a young age he performed with several bands while at college. In 1970 O’Sullivan had his first success with ‘Nothing Rhymed’. He went on to record six number one songs worldwide. Between 1970 and 1980 he had his most successful period. Today O’Sullivan continues to record and perform. He regularly performs in Great Britain, Ireland and abroad. 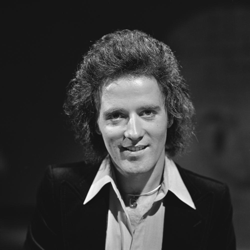 Gilbert O’Sullivan, singer and songwriter, reached Number One in the British charts with his song Clair in the year 1972 On This Day.